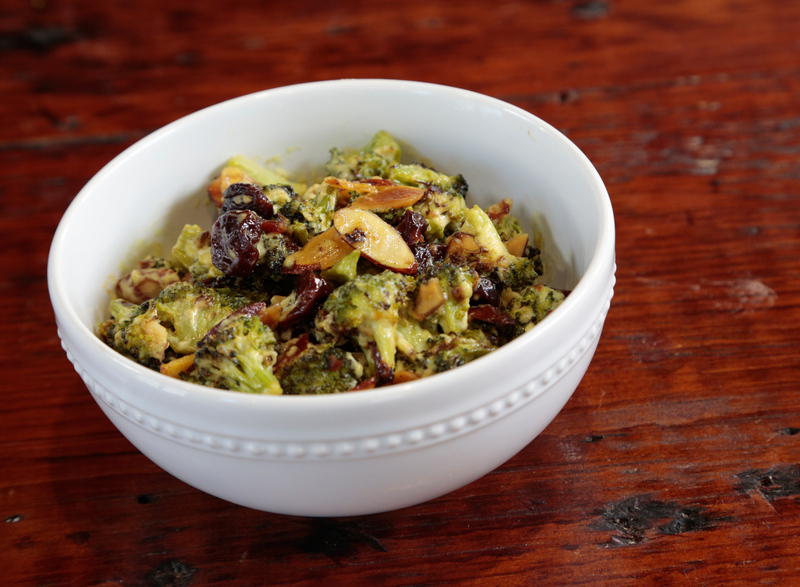 In a mixing bowl, toss the broccoli florets with olive oil, kosher salt, and yellow curry powder from Step Place on baking sheet on the bottom shelf of the oven and roast for approximately 15 minutes or until cooked through and lightly charred. Remove from oven and let cool to room temperature. In an 8-10-inch sauté pan, place the sliced almonds, minced ginger, garlic, and olive oil from Step Turn flame to medium low and let cook slowly while stirring frequently for 10 minutes or until the almonds are golden brown. Look for a gentle sizzle of the ingredients in the oil to ensure your pan does not get too hot. Once almonds are golden, add the curry powder and cook for an additional 1 minute. Remove from the heat and pour over the cooked broccoli. Stir in the Blue Plate Light Mayonnaise with Greek Yogurt and dried cherries. Enjoy this salad warm or chilled..